The venue couldn’t have been more perfect; the Gods were with us, the sun shining down on Royal Victoria Docks, bathing our course in the warmth and light that has been a stranger to our shores for most of this summer. 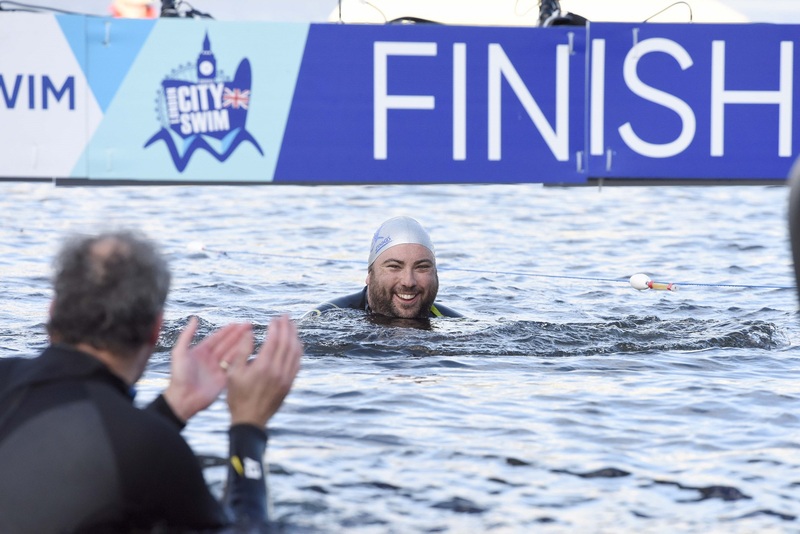 This was the inaugural London City Swim, and it was amazing – Glazier Design did the graphics, but we also took an active part in the promotion of the event and we joined in and swam for MND! 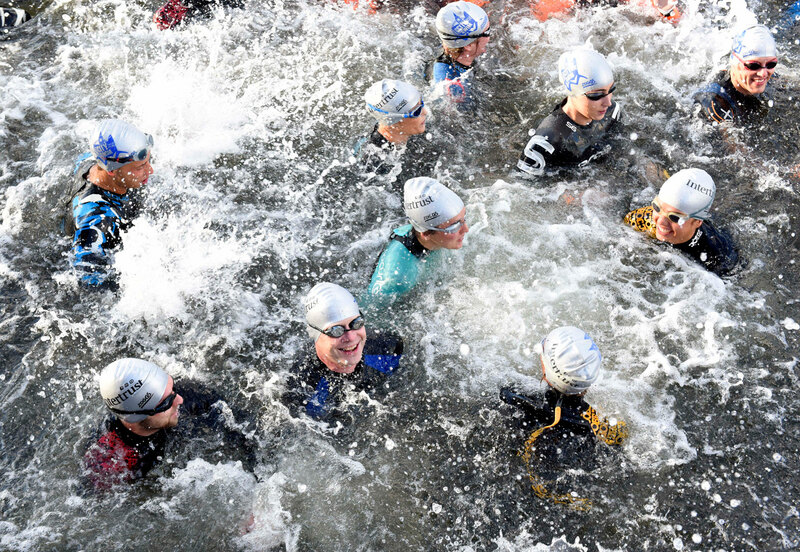 Some of us (the 300+ swimmers) entered the water with slight trepidation – this is London after all, but it was pleasant at 17C and before we had a chance to get cold, we were off, swimming 500m in the docks. OK, that’s not a long way, but for a first-time open water swimmer, it felt it. Look at those orange buoys above – we swam round them – looks far enough to me, but in Amsterdam they swim 2500m! I must admit that it wasn’t front crawl all the way – I did a little backstroke to get my breath back and if I am honest a couple of times, just a little floating. In the last straight, the sun shining in my eyes, my steamed up goggles useless, I thought my shoulders had fallen off. However it is hard to describe the feeling of exhilaration as shouts and cheers from the spectators brought us home and the finish gantry beeped and I felt ground beneath me. 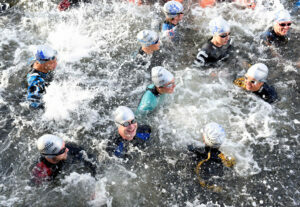 I did the swim in 16:03, which I’m happy with – Harry who works for me did it in 13:29. I’m treating these as targets for next year. One of the dutch swimmers was Jan Kramer, who is living with MND. 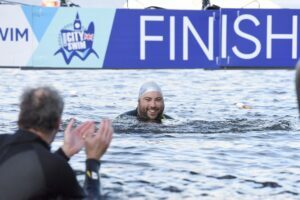 He took part in the Amsterdam City Swim and with the most amazing support team of friends and family, swam London as well. Motor Neuron Disease (what you might know as ALS from Ice Bucket Challenge fame) is a non-reversible, incurable, degenerative condition. When you are diagnosed, most likely your life expectancy is around 18 months to two years. We must find a cure for this disease. As many friends know, we have the great fortune and honour to work for Professor Stephen Hawking and his Foundation. This has led to us creating stamps for the Isle of Man Post Office and a video for an event at the Bank of England amongst many other things. 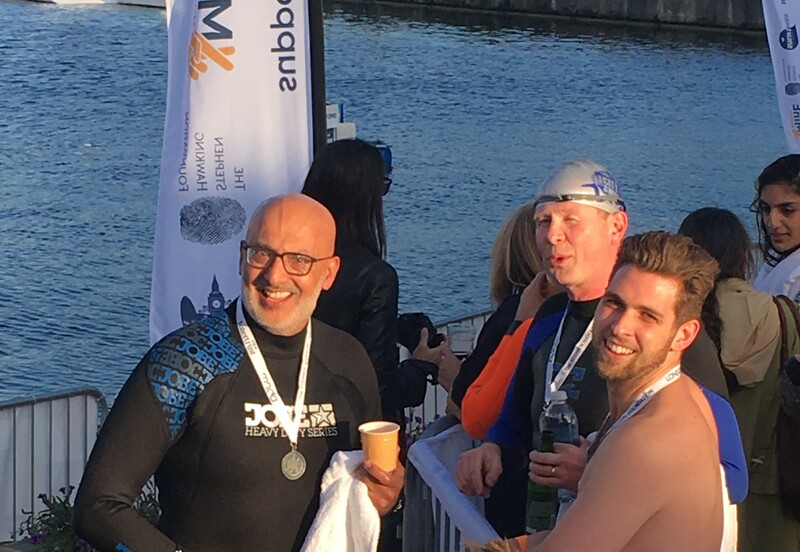 This year it led to us diving into the beautiful open water to raise money for Project MinE, which will sequence the genes of 15,000 people with MND and 7,500 people without it, looking for genetic markers that could allow early diagnosis and possibly one day treatment or a cure. All the money will be channelled through the MND Association and The Stephen Hawking Foundation. And boy, did it raise some money – over £120,000 in donations. An incredible team of volunteers, inspiring people, well organised companies, the charities, and I’m proud to say, Glazier Design played a part as well, doing the graphics and a few other things. Lead sponsors Intertrust covered all the expenses of the day, so EVERY SINGLE PENNY raised in donations at London City Swim went to Project MinE. What an exceptional way to kick off the event in London, that will now be annual. Co-sponsors Barrows were joined by many other companies including EY, Coca-Cola, Heineken, Zoggs, and many others in supporting this amazing event; reading the entry list is like reading an address book for the City of London and Canary Wharf – next year will be even bigger. There is still time to sponsor me, and remember, every single penny goes to Project MinE – many thanks to those who have already donated over £700 – let’s see if we can hit £1000 before I sign up for next year’s swim! BUT in 2018, why not swim with me, and together we will find a cure for Motor Neuron Disease. I will probably be with this guy – oh yeah, this guy – Matt – who seems to have got me to agree to swim in New York and Amsterdam – more about this guy another time!